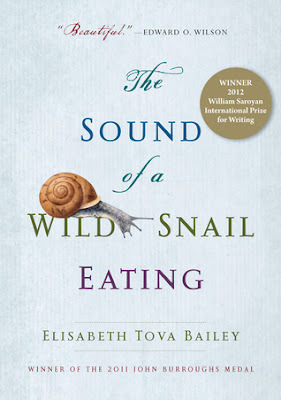 In a work that beautifully demonstrates the rewards of closely observing nature, Elisabeth Bailey shares an inspiring and intimate story of her uncommon encounter with a Neohelix albolabris —a common woodland snail. What a beautiful little book! I read this as I have a chronic illness too, which the author uses as her theme of how it makes time stand still and makes you notice the little things while you're bedbound, not knowing where the illness will take you next. In her case, the little things was a woodland snail that a friend got for her as company. And the more she's restricted in what she can do each day, the more she watches what the snail gets up to and it's a fascinating study beautifully written that really captures your heart as you read. Only about 170 pages long, but there's so much detail of the exploits of her snail and it really explores the ways of the snail! Who knew a tiny little creature could be so fascinating to read about!! A really heart warming book that is enlightening! Definitely recommend to those suffering with a chronic illness as you'll find yourself nodding along with thoughts that the author shares. But even if you don't have an illness, it is an illuminating read and one that makes you think and look deeply at the world around you and how much we DON'T normally notice!